The Highest Concentration Of Unique Mammals Is Found In? Traditionally The Irish Scare Away Spirits On New Year's With? A survey of the Earth reveals, rather quickly, that islands are hot spots of diversity. Cut off from mainland areas, the contained ecosystems of islands offer a place for creatures to evolve, adapt, and thrive. While the big names in island diversity, like the Galapagos islands and Madagascar, are the most likely to spring to mind for most people, recent research has revealed that Luzon Island, the largest island in the Philippines, has the highest number of unique mammals on Earth. Why Luzon? Not only is it a large island and distant from any mainland area, but it also has several other factors that favor a diverse ecosystem. First, it’s a volcanic island that has never been connected with any continent. Second, it’s quite old (for comparison, it’s at least five times older than the oldest of the Hawaiian islands). Finally, the island is home to many high and separated mountain peaks. These high peaks serve as sky islands of sorts, where mammalian families have split into separate species over time as they adapted to conditions on the different mountains. 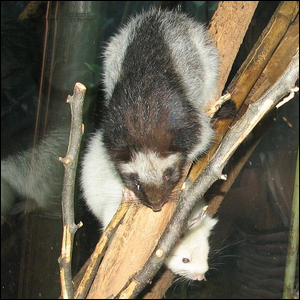 As a result of these conditions, researchers found that of the 56 species of non-flying mammals located on the island, like the northern Luzon giant cloud rat seen here, 52 of them are found nowhere else in the world.